Strong, stirring spirituals and tuneful, jazz-flavored settings of Shakespeare's timeless lyrics are the mouth-watering ingredients of the Cambridge Singers' eagerly-awaited new album Feel the Spirit. John Rutter has written vivid new arrangements of seven well-loved American spirituals for choir, with soloist Melanie and the BBC Concert Orchestra joining with the Cambridge Singers for this world premiere recording. Another notable 'first' is jazz legend George Shearing's captivating new cycle of Shakespeare settings, Songs and Sonnets. Those who associate George Shearing with instrumental jazz (and of course with his immortal Lullaby of Birdland) will be astonished and delighted at the youthful charm and skillful word-setting of this 81-year old master's choral writing. The final touch of sparkle is added by Proms favorite Wayne Marshall's piano, with Malcolm Creese on bass. 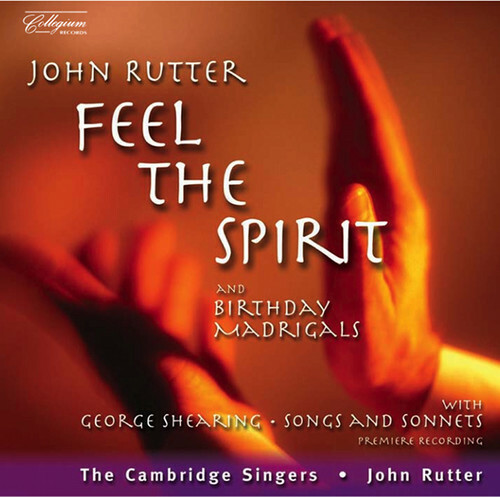 To complete the album, John Rutter's own Birthday Madrigals - written in 1995 to celebrate George Shearing's 75th birthday - also receives their premiere recording.